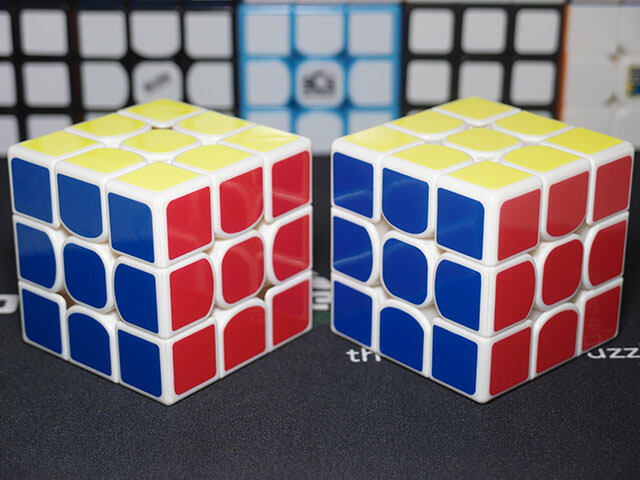 If you couldn't guess from the entirely not-Chinese sounding name, the Valk brand comes from the name of Mats Valk, a former 2-time world record holder and still current world-class cuber. 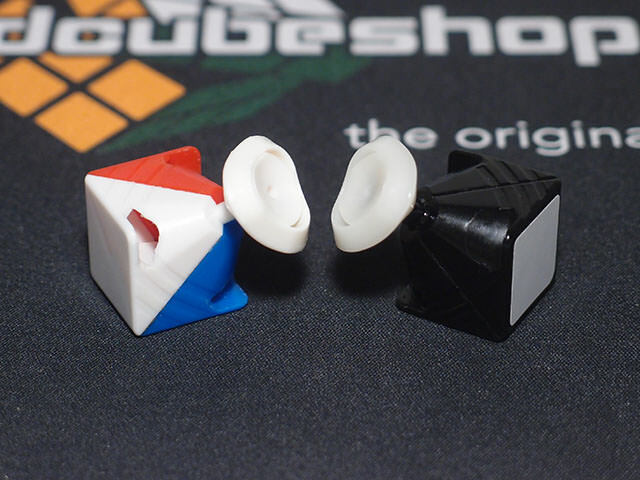 QiYi partnered up with him to design and release the Valk 3 in mid 2016, which instantly became known as one of the best cubes money could buy. It stayed at the top position of the market (sharing it with the GTS and Air) for quite a long time afterward, lasting well into 2016 and into the release of other, newer cubes. Recently, though, there's been a horde of new releases on the market, and something tells us that the kings of last year won't stay that way for much longer. QiYi has released this latest iteration, the Valk 3 Power and Power M, to stay competitive with this horde, and have modernized them in many ways; in particular, as the Power M name indicates, this cube now comes in a factory magnetized configuration. So what's it like? Does it deserve the Power moniker? Let's find out. QiYi took a page out of MoYu's book with this cube's box: the box is now magnetic. After coming out of its included paper sleeve, the magnetic flap opens to reveal the cube resting diagonally (which happens to orient its logo upright) on a foam insert. The included accessories are under the foam. What do we have for accessories? A small cardboard box and, in the case of the Power M, a bag of springs. Huh. It's not clear if the springs are any different from stock or if they're just spares. The box includes your typical QR codes, some Mats Valk stuff, an...odd black cloth pad, a giant Valk sticker, and an extra set of stickers. It's also a nice touch that in the spare stickers, they included a Fluoro Pink side for those who like pink over red or orange. All in all, very good accessories kit. It's debatable whether all of these are actually needed, but they're certainly nice to have. Left is a Valk 3. On first glance, it's still very much a Valk. On second, it...well...still looks very much like a Valk, and especially on the white cube is practically indistinguishable. It's still 55.5mm, still has the same Oracal half bright sticker scheme, and has pieces still shaped exactly the same. 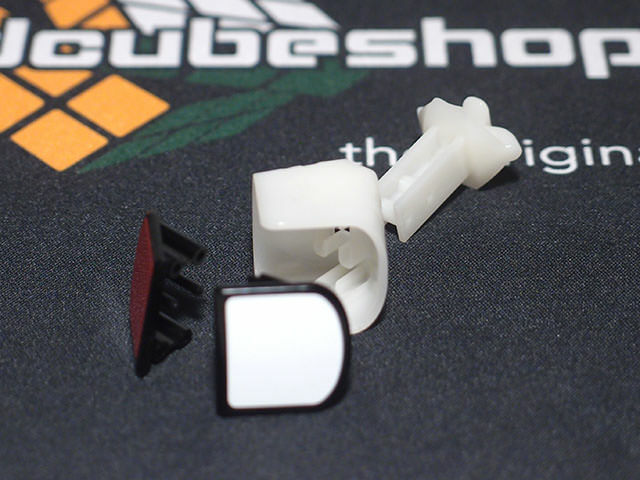 The biggest difference anyone's likely to notice is the primary internals of the edges on black and stickerless cubes (more on that later), or the logo that's now printed into the center sticker (a nice touch). Picking it up, though, is a different story. It's been a trend for some time now that cubes are getting lighter and lighter - where 85g cubes may have been common in 2015, nowadays it seems like everyone is aiming for 75g, and in fact most of the heavier cubes released in the near past have been quite poorly received, though usually for other reasons (e.g. the Mars or the Aolong GT). QiYi went straight against this trend. Instead of lightening the cube as the GTS2 had done with the GTS1 or each successive generation of the Air has done, the Valk 3 Power is now 90 grams - 10 full grams heavier than the original Valk 3. As an inescapable side effect of magnetization, the Power M is heavier still - 97 grams. This may not actually be a very large number, but trust me, when you're marketing these products towards a bunch of speedcubers turning them 20 times per second, they'll feel the difference. The question then becomes whether they'll hate or love it. Full disclaimer: I'm not good at setting up cubes. I thought I was, but then Cam had to show me up with a Cosmic and I lost all faith in my abilities. This simply represents a best effort. Tensions were already quite even out of the box, though a bit tighter than I would have liked it. There was no spring noise, and the way this was accomplished deserves a mention later. My setup for both cubes consisted of loosening each screw a quarter turn to enable full cutting, and applying two drops of Candy Cane lube to speed them up and give them a refreshing minty smell. I have since done about 500 solves on the Power and 350 on the Power M.
Maybe I should start judging cubes on smell as well. This is nice. Yeah, it's still a Valk. It still turns with the same smooth glossy feeling, and still has just a bit of a tactile click to it at high speeds. Unusually for a heavy cube, it's even quite fast, but reigns in that speed with excellent stability - again, about on par with the original Valk 3. Again, the biggest difference has to do with its weight. With a heavier cube comes heavier layers, and with heavier layers comes a heavier turn. It's pretty easy to distinguish the extra weight behind every turn of the cube: it takes just a bit more effort to flick into a turn, and the weight of the cube wants to carry itself just a bit further after you let go. The original Valk 3 was a good deal lighter, and each turn felt a bit more direct and attached to your finger as a result. Is this a welcome change? Who's to say? 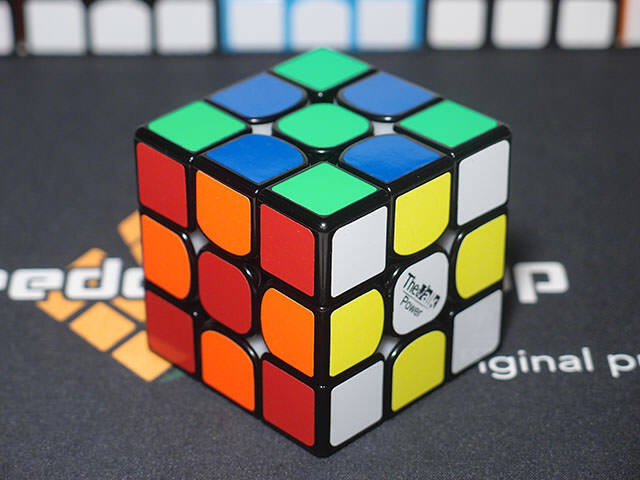 I personally prefer lighter cubes, but it doesn't surprise me if someone thinks the original Valk 3 is too light. The magnets on the M version are on the strong side, but feel quite a bit lighter against the weight of the cube. It's just enough to maintain the cube's shape in your hand and provide some tactile feedback, while not being annoyingly snappy. It's a good implementation of a magnetic cube. Good job, QiYi. As we've come to expect any high-end speed cube to do nowadays, this cube does clear corner cutting, though it needed the help from tensioning to do so. It leans a bit further towards forward cutting than I'm used to, at 55 degrees forward and 35 degrees reverse. Forward cutting actually takes quite a bit more force than the original Valk 3. I'd put the effective corner cutting mark somewhere around 48 degrees, which is less than the (remeasured) 51 degrees of the original. The gain to this tradeoff is that corner cutting on the Power and Power M feels much more snappy and satisfying, as opposed to the somewhat dull and slightly crunchy feeling corner cutting on the original. Effective reverse cutting has decreased somewhat as well, from the (remeasured) 33 degrees to 31 degrees. It still retains a slightly snappy feel from the original, which I have to say I don't like as much as the smooth gliding action from GAN cubes. Of course, it's not likely to make a difference during anyone's solves. Luckily, due to the very snappy feel of forward cutting, any effect the magnets have on the feel of the corner cutting is largely overwhelmed. The Power M doesn't feel very different from the Power, save for being just a tiny bit stiffer. Popping is not an issue, as usual. Corner twisting did happen very rarely on the original Valk 3, and as I noted in my reviews of it a year and a half ago, it was rather easy to corner twist by hand. Luckily, that's been improved, if not fixed outright. On comparable tensions, the Power is noticeably harder to corner twist, and the Power M more so because of the magnets. In a little over a eight hundred solves on both of them, I have yet to experience a corner twist, though admittedly that is a rather small number compared to the tens of thousands I've put into the original Valk. Improvement across the board here. From a first glance, the Power is quite different from the original Valk 3 internally, but that's mostly due to the primary edges and corner bases. The geometries are actually very similar. That being said, there are quite a few notable differences, so let's get into it. The edges on the original Valk were molded from three pieces: two halves and the base. The edges on the Power are now four pieces, and QiYi took a rather interesting approach to it. The base consists of one piece with a shaft that extends up into the main body of the edge, which is another piece. In order to then make stickerless possible, the two external caplets slide sideways onto the body, and through a number of pins and corresponding holes, they also anchor the base in place. Why was it done this way? 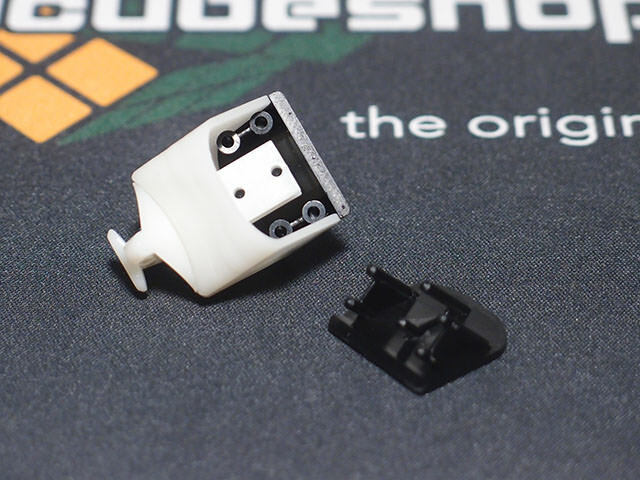 My best guess is that QiYi wanted to eliminate the seam on the body of the edge caused by a fully split cube, but using standard caps eliminates the possibility for stickerless. There is a potential implication to the way this was implemented. Unlike most split pieces where each half has both a male and a female side, allowing any two halves to be joined together, the Power's caplets are clearly separated into male and female. The result is that if you were to take a Power fully apart down to the caplets, you may have to be very careful how you assemble the cube, or you may end up with duplicate edges at the end. What's more, I'd be very hesitant about buying 6 stickerless cubes to make force cubes, since there may not be any guarantee that there will be exactly 12 male and 12 female caplets of each color. Honestly, I feel like this is something they could have done better. I doubt there's much of a drawback to using half-male half-female caplets, but it would certainly take away both of these issues mentioned. The corners, on the other hand, are still done largely the way they were on the Valk 3. They have a fully split body which terminates in a small stalk that snaps into the base, and a plug keeps it expanded to anchor the base. The biggest difference is the hole under the squared corner extension has now been plugged up. Presumably filling in the hole didn't hurt corner cutting too much. Both the corners and the edges have largely the same geometry as the Valk 3, meaning they're still shaped practically identical despite the edge being manufactured in a completely different way. In fact, sticking a Valk 3 edge into a Power and vice versa both work perfectly. Show us your best, FrankenCube makers! The core is another thing to note. 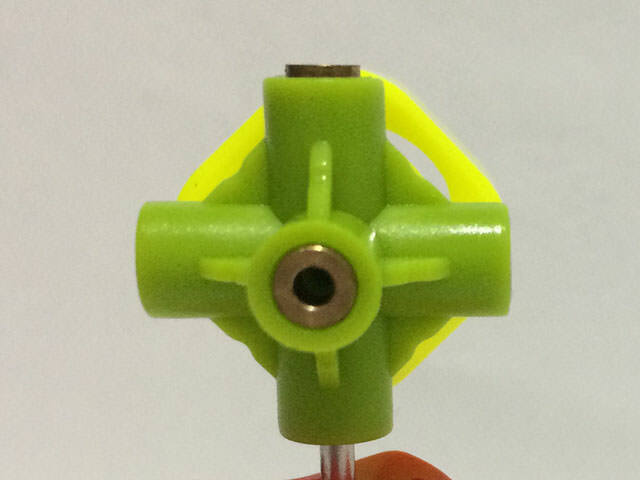 It's still made from QiYi's signature green plastic, but has metal inserts on each side. You ever assembled a Dayan DIY kit and when you screwed in the screws, they ended up crooked? The metal liners all but eliminate that issue - they guide the screw in to be perfectly straight before the screw hits the threads in the plastic of the core. There's been quite a bit of confusion about these liners. Initially, some people thought they were in fact maglev, and later on it seemed that everyone had agreed that they're thread liners, designed to prevent the threads from stripping. I thought so too until I took a closer look at them, and that's when I realized - they're not threaded. This is the best picture I could get of it, and honestly you can't tell much from the picture. It's a lot easier to tell if you look down a core yourself. 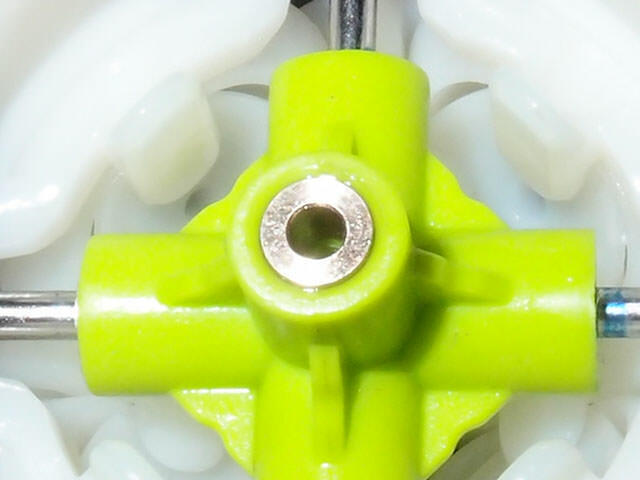 Basically, the threads begin in the green of the plastic core underneath the metal liner, and while there may be some scratches in the metal that look like threads, they're more likely left over from threading the screw into the plastic. What this means is that the sole purpose of the liners is to guide the screw in straight before it's threaded into the plastic, preventing crooked screws during assembly. They don't do anything against stripping. Why didn't they thread into the metal itself? My best guess is that metal-on-metal thread contacts tend to be pretty loose, and they can undo themselves with some minor vibration or rotational forces (as would be encountered in a speedcube). That's the reason locknuts, which have a nylon insert, are recommended for solving the stripping issue with SQ1 cores as opposed to standard metal-only nuts. That being said, there's a substance called threadlocker which tightens up metal-on-metal thread contacts, and I wish QiYi had used actual thread liners with threadlocker so that the issue of stripping could be solved as well. There's another issue. I had a nagging feeling that the liners would be problematic and, at least from one user's account, it looks like I was right. Being a separate piece from the plastic core, the metal insert must be bonded or pressed into the core, which means it has the potential to come out. Yong Hui sent me this picture of his Valk 3 Power core, and as you can see the insert on the top side of the core is showing just a little. Furthermore, /u/NeverDefyADonut from reddit noted that on his Power, the liners have a tendency to fall out completely when he has the cube disassembled. This being the case, it may have actually been a blessing in disguise that the screws weren't threaded into the metal, because if they were they could fall out with the metal liners. 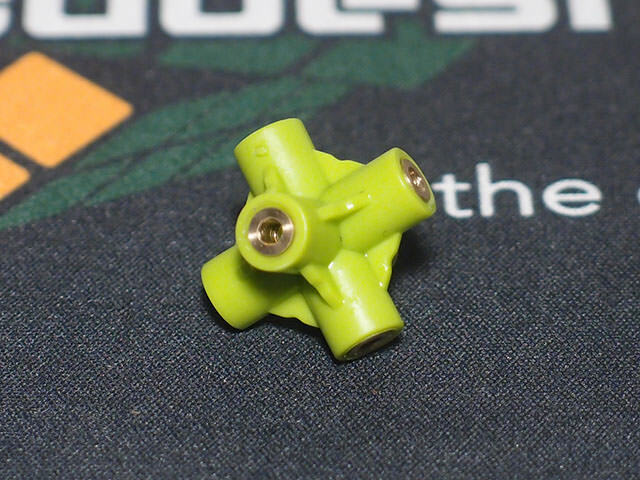 However, given that QiYi has come so close to making a core that solves stripping, I now want to see a core that has secure, threaded metal inserts that solves both problems. Finally, the last thing that deserves a more positive mention: the springs. Why would I waste time on such an inconsequential part? Well, take a look. Notice the difference? The bottom end of the Power's spring, the end that touches plastic, is curled up and in. You might think this is a manufacturing defect, but it's more likely a novel way to solve the issue of spring noise: now that the sharp pointy end is gone, there's nothing to hang up against the plastic to make the telltale ting ting ting of an unlubed core. Excellent idea, QiYi. I would have liked to see the top end given the same treatment, but it's a bit less necessary as it touches the screw rather than the plastic. 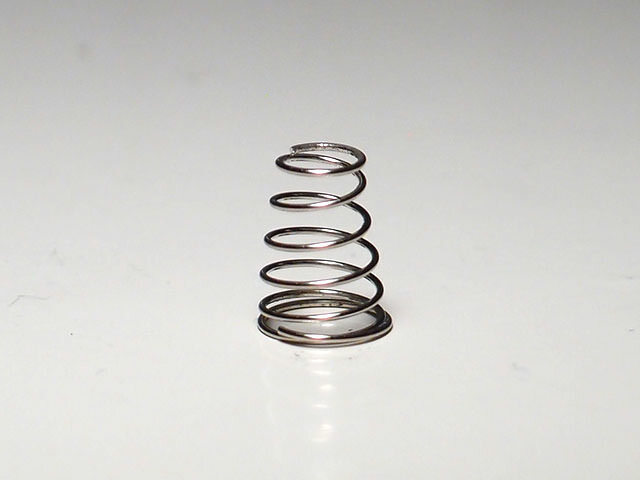 Both being made of hard metal, the spring can't grab onto the bottom of the screw head nearly as well. This doesn't mean you shouldn't lube your core, of course. Putting a layer of oil between the spring and the plastic will still serve to lengthen the lifetime of the two rubbing surfaces. Overall, the implementation of the mechanism of the Valk 3 Power and Power M is quite unique, and represents a good attempt to modernize the Valk 3. I can hardly fault QiYi for that. At this stage, though, the original Valk 3 is hard to improve on and the Power's success is questionable, but I'm excited to see where these new developments will lead. After disassembling both cubes, I'm surrounded by the smell of peppermint. SCS, can we keep making Candy Cane please? Ah, yes, possibly the most important question. Is this cube worth it? The Power and the Power M retail at $24.95 and $38.95, respectively. Sadly, as ridiculous as it sounds, this is where the pricing of flagship cubes seems to be headed. 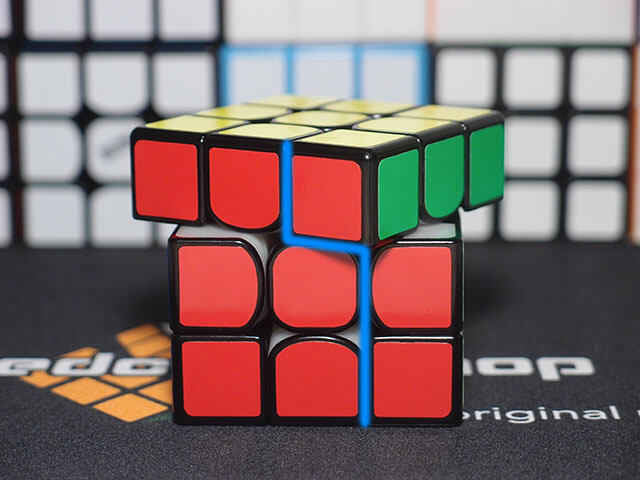 The Valk sits pretty evenly in the middle of the pricing spectrum, flanked on either side by the MoYu cubes and the Air S. So while the Valk Power and Power M are not the cheapest flagships, they're not the most expensive either. The problem is that the Power and Power M don't do nearly as much in practice to set themselves apart from the MoYu cubes as the Air S and SM do. The latter have a rather unique weightless feel and a novel, easy way to adjust the feel of the cube; the former, as much as I hate to say it, feel somewhat generic. The Valk's feel was amazing when it came out, and don't get me wrong, I still love it, but in the time since plenty of cubes have been released that feel pretty similar to it. You're paying a pretty hefty chunk of cash more for a cube that doesn't necessarily feel any better than the cheaper MoYu cubes, especially in the case of the M versions. Instead, what that money is going towards is a host of novel new technologies in the cube. You're getting things like the unique implementation of a seamless edge, the metal-lined core, and even just small things like the smoothed out spring Some of them need some further refinement (ahem the core), but all of them solve some pretty important issues and most likely have a place in the future of cubes. So, is it worth spending extra to support the future development of cubes? I'll leave that one up to you. It's a bit too heavy for my taste. That being said, it makes up for it in speed and stability, and I like it a surprising amount for being such a heavy cube. The magnetic version isn't bad either, with the magnets pretty well matched to the cube's weight. (Keep in mind the majority of magnetic cubes would get around a 4/10 from me...I really don't like magnetic cubes.) It's just a bit unfortunate that the magnets end up increasing the weight even more. In the end, the way I see this cube is a more expensive, technically better sidegrade to the Valk 3. It improves on a few things, but those things don't end up affecting performance much at all. That being said, the Valk 3 was an excellent cube by any measure, so maybe it's not such a bad thing that they didn't change a winning formula. Maybe a cube like this is what we need. Something that plays around with new technologies, even if it's not quite nailed perfectly the first time or if it ends up being a bit more expensive. Because the ideas have been created and the groundwork has been laid, and things can only get better from here. 1. On sticker grade: Cube companies have been flaunting their move to Oracal stickers for the better part of two years now, first from Gan then Valk. Now, Oracal in and of itself does mean "better than nameless Chinese vinyl", especially the kind of stuff MoYu used for the GTS (v1), but Oracal has different grades of vinyl too. Cube companies were using a lower economy grade vinyl called 641. The problem is, fluorescent colors are only available in two higher grades called 6510 and 7510, which correspond to 651 and 751 non-fluoro. As a result, most cubes would get a mixture of 6510 and 641, and since the white, blue, and sometimes red are the non-fluoro colors, many people reported white, blue, and red chipping far worse than the fluoro green, orange, and yellow. The solution to this is obvious: move the non-fluoro colors to 651 as well, so that it could be similar in quality to the fluoro 6510. It's only marginally more expensive, and certainly can't compare with the cost of using three expensive 6510 sides to begin with. The Valk Power and Power M seem to be the first cubes that have actually done so, unless Gan made the move secretly without telling anyone, so for that I again have to give QiYi credit. Also, this sets a positive precedent for cubes in the future. From now on, I'm expecting flagships to come with 651 on all of their non-fluoro colors. 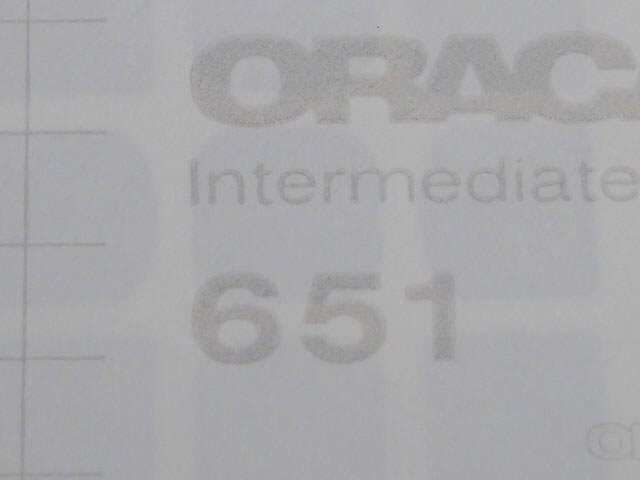 It's not easy for me to tell if they don't, since I keep my nails short and generally don't chip even 641 stickers, but if I do find that a cube is still using 641 that will be a point docked off from their objective score.